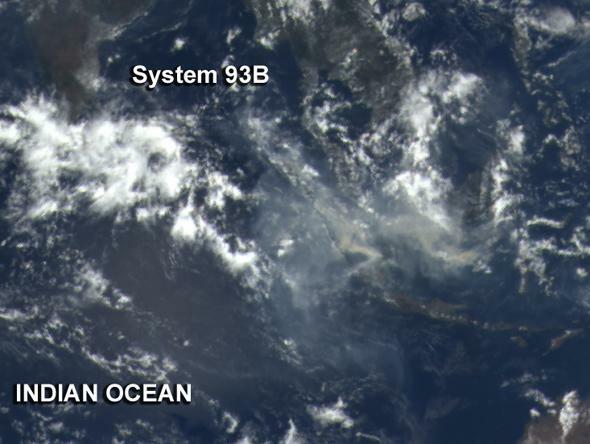 Earth from space: Indonesian peat fires show up in satellite photos. This image of Earth from space should be beautiful and tranquil, but humanity’s ugly influence can be seen. Normally, I think pictures of Earth from space are among the most beautiful of all astronomical photos. Our home is gorgeous, especially when seen from afar. But Monday, NASA tweeted a picture of our world whose ugliness made me literally gasp when I understood what I was seeing. The photo above is from the Earth-observing DSCOVR satellite, which sits 1.5 million km (almost a million miles) over our planet, taking full-disk images every hour, which are then put online for the public to view. That shot was taken on Oct. 25 at 05:37 UTC. 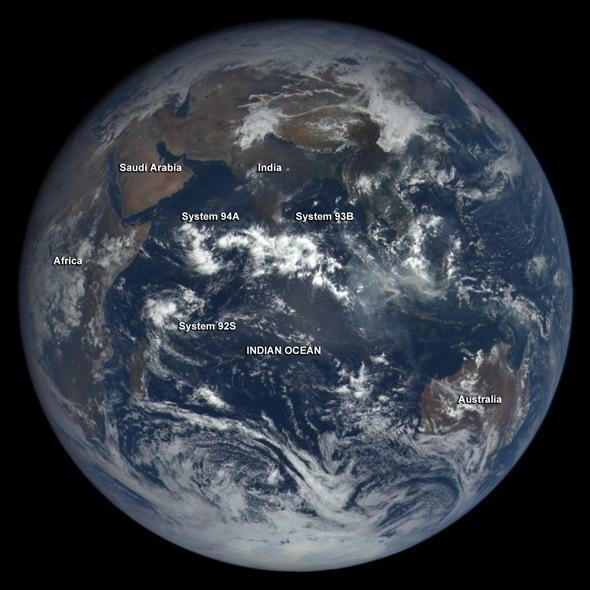 NASA put the picture on Twitter to point out the three tropical low systems developing in the Indian Ocean. Which is great, and very cool. But what caught my eye was the huge grayish hazy patch over Indonesia, over to the right a bit. It took me a moment to figure it out, but then it hit me: That’s smoke from the Indonesian peat bog fires that are raging out of control right now. Fires in these peatlands have been going off and on for years, but 2015 is on track to be the second largest on record (after 1997). There have been nearly 100,000 active fires recorded there in this year alone. A closer look. The smoke can be seen as gray, twisting plumes on the right. These fires are dumping vast amounts of carbon into the atmosphere in the form of carbon dioxide and methane. According to GlobalFireData.org, the fires this year have tripled Indonesia’s CO2 output, emitting as much as the entire country of Japan did in 2013. On Monday, President Obama met with Indonesian President Joko Widodo, and they talked about these fires. * Indonesia is the fifth largest greenhouse gas emitter in the world, and these fires aren’t helping. Worse, many of these fires are set purposefully to clear for agriculture, but the El Niño has worsened them significantly. The total amount emitted from these fires just this year is well over a gigaton, a billion tons, of CO2. Globally, humans put out about 40 gigatons of CO2 per year, so this is a staggering amount. As your eyes can show you. These fires can literally be seen from a million miles away. *Correction, Oct. 27, 2015: This post originally misspelled Indonesian President Joko Widodo’s last name.